In Visual Studio 2012 Microsoft provided test case management and test execution capabilities in TFS Web Access. It was part of Visual Studio 2012 Update 2. Now in Visual Studio 2013, new capabilities and features have been added to create and modify test plans in Visual Studio 2013 Web Access (TWA). You don’t have to switch to Microsoft Test Manager for Test Plans, Test Suites and Shared Steps creation. The entire ‘Test Case Management’ can be done from the Web Access. TWA connects you to Visual Studio Team Foundation Server (TFS) or Team Foundation Service to manage source code, work items, builds, and test efforts. 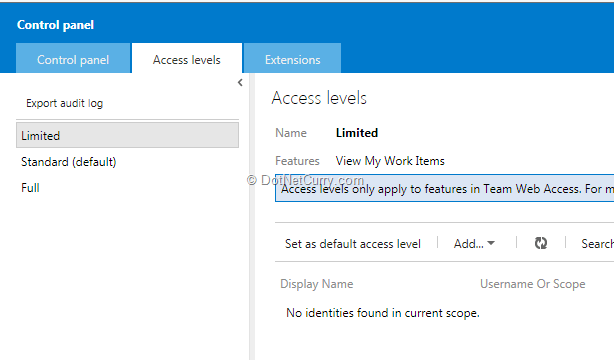 In order to access Test tab for Web Access, we need to provide Full access to the Windows user or Group who is accessing the functionality. The default option is Limited Access. We need to add the user to get Test tab by setting the option to Full. Now observe the Test tab (right next to the Build tab as seen in Figure 1). I had already created Test Plan and Test Suites using Microsoft Test Manager 2013. 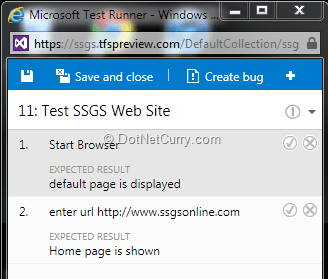 These artifacts start appearing in the Web Access under the Test tab immediately. The Test Plan has 3 Test Suites – Requirement based, Static and Query based. Each suite has some Test Cases. We can also see the different status of an individual test case. Note: I am also enclosing a similar Test Plan screenshot from Microsoft Test Manager 2013 for comparing the two. 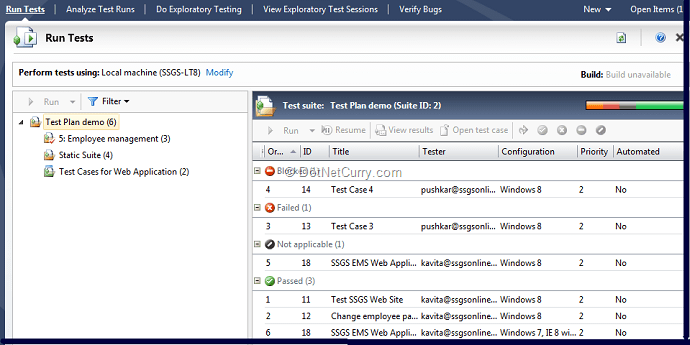 Observe the categorization of test status with Microsoft Test Manager. 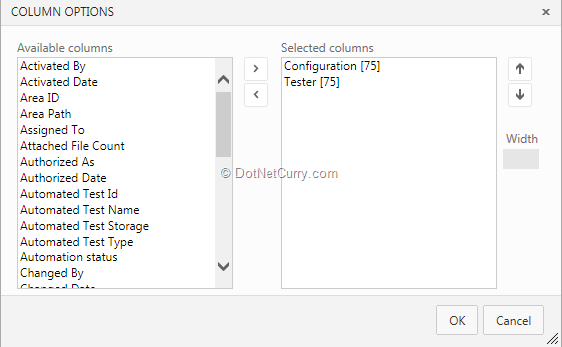 In case we want to customize the columns, we can do so as follows. The bracketed quantity as seen in the screenshot below shows the width of the columns. We can add certain columns from left hand side and the view will change. We can even create a new Test Plan. The Test Plan can have a name, Area Path and Iteration Path. Features like configuration settings, Test Settings and Test Environment can be added with Microsoft Test Manager 2013. Once a new Test Plan is added, we can add Test Suites to it. Test Suites can be of three types – Requirement Based, Static or Query Based. Even Shared Steps can be added if required. Creation of any kind of Test Suites will provide option for adding new or existing test cases to the Suite. A new Test Case can either be created with normal IDE or using Grid. We can provide all the details to the Test Case like Title, Iteration, Area, and Assigned To (ownership of Test Case). The Steps to the test case can be added as action and expected result. If the test case is testing a requirement, Tested Backlog Items tab can be selected and a link can be provided to it. 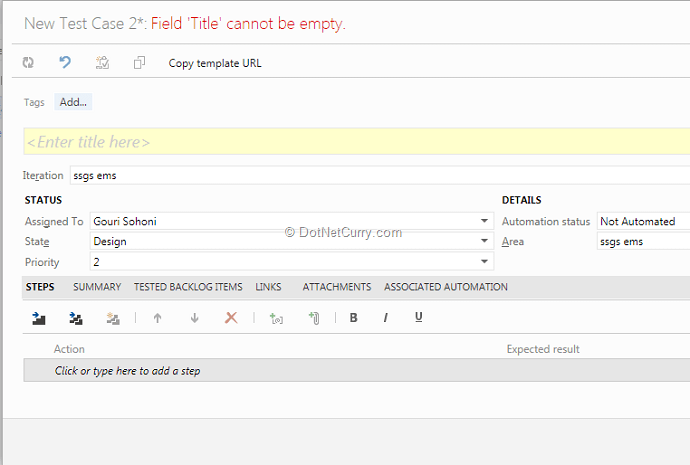 Any attachments we add to the test step can be viewed inline when the test case gets executed. If the attachment is in the form of image, the test step will show the actual image. If the attachment is in the form of a file, the file name with size appears. You can also add attachments when you run test case. These can be log files etc. If we select the option of creation of New Test Case with Grid, we get a similar screen as follows. We can add actions and expected result to each test case. Create a new Test Case by providing the title. All the test cases can stored in Team Foundation Server at once. When we have finished creation of Test Plan, Test Suites and Test Cases, we can start executing the Test Case. While running the test case, we have optionsof running the default way with Web Access or using the client (Microsoft Test Manager). 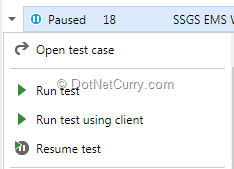 Once we start test runner, the test case with some steps is displayed in left hand pane (around 1/3 area of screen) and remaining area is available for actual execution as seen with Microsoft Test Manager. Once the execution starts and we encounter an error, we can create a bug, add a comment to it or add an attachment. Once the execution is completed, we can save and close the runner. We have various options to mark the test case as Pass, Fail, Block or Not applicable The test case can also be marked as Paused. For Paused Test Case, we later get Resume test as the option. While creating a bug with Web Access, it is possible to add comments, attachments along with the bug; however we cannot create a rich bug. For creation of rich bug we will have to use Microsoft Test Manager 2013. The links in terms of comments, attachments can be seen in the bug as follows. While Testing with Web Access there are some limitations. Basic testing can be executed but creation of rich bug, viewing test results, exploratory testing requires the client Microsoft Test Manager 2013. 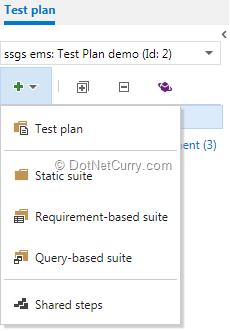 However despite of these limitations, being able to plan tests, manage full test suite and executing test cases right in your Visual Studio using the Lightweight browser-based Team Web Access, helps us improve quality in software projects, without leaving your favorite IDE workspace. As the following illustration shows, you can access a number of features from the Home page of TWA. You switch to different views and pages by first choosing one of the context view links at the top and then one of the pages within the context view. You can switch context between teams and team projects from the project context menu toward the top-right of each page. You access the administration pages by choosing the gear Settings icon. View backlog (Full): Opens the Product Backlog page which provides access to both the product backlog and iteration or sprint pages. See Create and organize the product backlog. View board (Full): Opens the Task Board page used to review progress during a sprint and update information for work performed. See Work in sprints. View work items: Opens the Work Items page used to create work items and work item queries. See Query for Bugs, Tasks, or Other Work Items. Request feedback (Full): Opens the Feedback Request form to invite stakeholders to provide feedback. See Request and review feedback. Go to project portal: Requires a project portal has been enabled for your team project. See Access a Team Project Portal or Process Guidance. View reports: Requires Reporting to be enabled for the instance of TFS. See Add a report server. Open new instance of Visual Studio: Opens an instance of Visual Studio 2012 and automatically connects to the team project context selected in TWA. Requires that you have a recent version of Visual Studio installed.